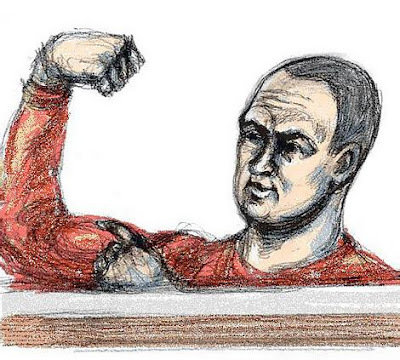 Sean Sonnet showing off his biceps for the benefit of court artists in 2004. A gunman hired by multiple murderer Carl Williams to kill an underworld rival at the height of Melbourne's gangland war has been jailed for 20 years. Justice Betty King today jailed Sean Jason Sonnet, 39, for a minimum of 16 years after he was found guilty of conspiring to murder former lawyer Mario Condello in September last year. Justice King said Sonnet was a "gun for hire" who was prepared to carry out the killings for money. "This was to be a cold blooded execution of a human being in a very public area," she said. When his jail term was read out, Sonnet hurled a tirade of expletives at Justice King, accusing her of denying him a fair trial and labelling her a "fg dog" and a "fg black widow". The Supreme Court jury had heard police uncovered a plot to kill Condello by accident after they bugged the car of a suspected drug trafficker. Police arrested Sonnet and his accomplice Gregg Hildebrandt near the Brighton Cemetery in Melbourne's south during the early hours of June 9, 2004. Sonnet was found to be carrying two loaded handguns as he and Hildebrandt waited for Condello to walk by with his dog. But the pair was acting on mistaken information because he wasn't living in the area at the time. The jury heard gangland figure Carl Williams hired Sonnet to murder Condello in revenge for the killing of his friend Andrew Veniamin. Condello was shot dead in the driveway of his Brighton home in February, 2006.